Yards of flowy susti with hand-twisted fringe move with every confident step you take! Not technically a Magic Dress, this still has many styling possibilities: an attached triangular panel can be tied at the shoulder, tossed over either shoulder or both... and adding your favorite brooch will inspire your creativity! 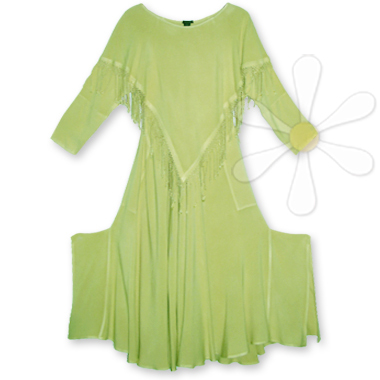 The two 18" side slits at the hem can also be tied into various effects... it's fabulous frolicking fun! Free your inner wild woman every time you open your closet, dress like a goddess every day... Why not?